What Is I Ching Hexagram 39 All About? Hexagram 39 yinjing shows how to deal with a temporary setback. By pondering the situation and working with others, you can make progress again. 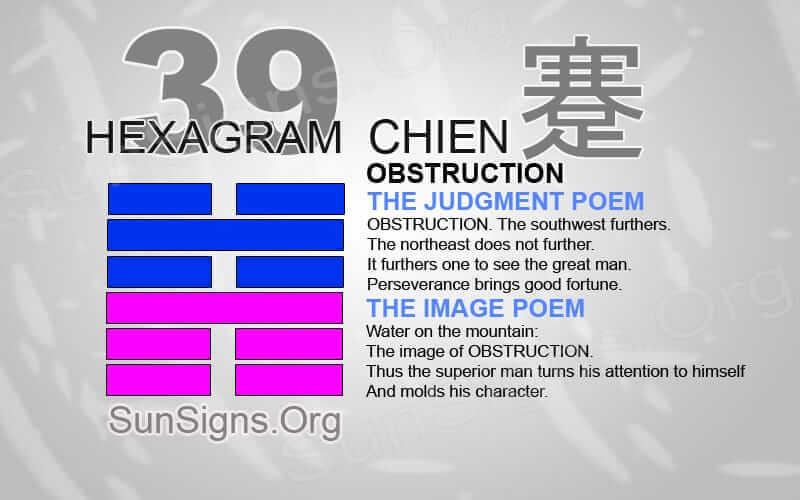 Hexagram 39 symbolizes the event of obstruction to progress. This can be very frustrating, but when dealt with properly, the situation will pass by very quickly. Turn the mind inward to discover the correct answer to the problem. Hexagram 39 shows that working together to solve a problem is necessary. You can resolve conflict or obstacle quickly and without any damage. Sometimes it takes strengthening a weakness to make the group stable once again. Only when we reach out to others to find a common solution is progress able to start again. It is easy to fill the mind with negative thoughts because of anger and frustration. But take the time to stop and meditate. You can change your mind to fix any emotional problems that might be causing the practical issue. When any progress has come to a halt, it is important to think clearly. Think about what you need to do to initiate progression once again. What changes do you need to make? Am I currently doing something wrong that is causing the problem? What can I be doing differently? These are questions that you can ask in any situation to find the answer to this problem. Often when we look at ourselves instead of the relationship as a whole, the hindrance is more natural to see and then fixed. During this time of obstruction, take the time to meditate on the current frame of mind. Is the flow of thoughts positive or negative? It sometimes takes a moment of stepping back to realize an attitude problem that needs to change to progress. When we blame others for our problems, it is then impossible to find a solution. Sometimes, feelings of stagnation arise in a relationship. Now is the time to ponder deeply about how you can spark the essence of true love once again. In the work area, take the time to come to the aid of others to act together to find a solution. It is important to gather your strength and resources to help you overcome the obstacle. Something has stopped the flow of progression in the work area. It often takes the effort from every team member to get things moving again. Seek to help others who might be having troubles in their department. Fixing one small detail can often start the work progression once again. Other times try to find others that are willing to help you overcome the problem. Hexagram 39 divination symbolizes that there will come a time when an obstruction comes before us. This hexagram gives wisdom on how to deal with the situation. It also shows some options to take to overcome the difficult time. Through any phase of difficulty, it is essential to keep a clear head to think correctly. Being overwhelmed with emotions can only hinder the process of finding a usable solution. It is one thing to be able to recognize the problem. It is another to know how to deal with the problem effectively.